John is the busiest and most popular speaker in America on parenting and family issues. In a given year, John delivers more than 200 presentations to audiences nationwide. We work with schools, churches, PTAs and other organizations and groups, large and small, to help create events that are a success for both sponsor and audience. All keynote presentations are customized to suit the unique needs of each customer and the relevance to their audience groups. To book John, call 704.860.4711 or click here to fill out a speaking inquiry form. The so-called “strong-willed child”—oppositional, argumentative, assertively demanding—presents a unique challenge to his or her parents. The adjective is synonymous, after all, with “hard to discipline.” In this enlightening and entertaining presentation, John outlines a virtually fail-safe formula for successful discipline of not only the child who is strong-willed, but any child. The strong-willed child’s parents ask, “How can we get our child to stop arguing with us?” John answers that question, giving a prescription he absolutely, positively guarantees will stop arguments forever. The strong-willed child’s parents ask, “How does one discipline a child who does not want to do what he is told?” John answers that question too, explaining that the secret to effective discipline is found in mastering each of discipline’s “Three C’s”—communication, consequences, and consistency—and John never fails to impart that mastery to his audience. The strong-willed child’s parents ask, “How can we put an end to discipline problems that have been hounding us for years?” Believe it or not, John answers that question too, and the prescription is practical, not pie-in-the-sky. Parenting the Strong Willed Child can be formatted as a 90-minute presentation or expanded into a 3-hour workshop. Another highly popular talk is “Parenting the Strong-Willed Teenager.” John can also customize talks to the needs of specific audiences. For example, teachers usually rate his in-service, “Working with Parents of Problem Students” as the best they have ever attended. Children depend on parents for the two L-words of Love and Leadership. In today’s parenting culture, Love is often weakened by well-intentioned enabling, and Leadership is weakened by the equally well-intentioned attempt to be “popular” with one’s children. In this entertaining and thought-provoking talk, John tells parents how to deliver these two essential parenting ingredients in ways that strengthen children emotionally and help them grow into responsible, compassionate citizens. 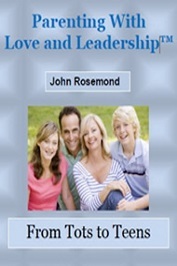 John helps parents understand how to best deliver love and leadership from toddlerhood right on through the teenage years. He introduces important and provocative concepts, such as Why Children Love to Be Ignored. John also addresses how the subtle but substantive changes of the adult female’s role in parenting is changing our culture…and not for the better. This seminar can be designed as a two part workshop for a weekend day or one ninety minute talk for a weekday evening. The keys to effective discipline are the “Three C’s” of clear, authoritative communication, compelling consequences, and consistency. The key is to assign emotional and practical responsibility for a child’s misbehavior to its rightful owner—the child. Included are unique tools for managing sibling rivalry, bedtime problems, disobedience, and public misbehavior. In addition, parents learn how they can work with their child’s teacher(s) to improve both classroom behavior and academic performance. Graduates of this workshop routinely report that discipline becomes less of an issue in their homes, communication with their children improves, and the overall quality of life in their families is greatly enhanced. 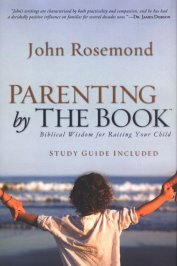 Parenting by THE BOOK is a Scripture-based parent education curriculum developed with the intent to equip parents with powerfully effective child-rearing skills. All of the information, materials, methods, and recommendations included in the curriculum are based on Scripture, supportive scientific research, and good, old-fashioned common sense. 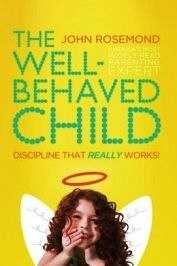 A parent who comes to Parenting by THE BOOK seeking techniques and methods with which to solve specific discipline problems will not be dissatisfied. However, if acquiring techniques is a parent’s sole aim, then that parent may never understand that each of the methods presented in PBTB grows out of a common soil—the soil of Scriptural truth. Once a parent roots himself/herself in this soil, it will become clear that a particular parenting mindset is what solves child-rearing problems, not methods. John’s goal is to inspire and empower parents to raise well-mannered and well-behaved children of competence and character, children whose decisions are consistent with the fundamental precepts of Judeo-Christian morality. This popular 90-minute presentation is the “centerpiece” of John’s presentation menu. While it stands alone, Assuming the Power of Parenthood can also be scheduled along with Parenting the Strong-Willed Child (see description below), making for a powerful and inspiring combination. When so combined, the two presentations should be titled Parenting the Strong-Willed Child—Part One and Parenting the Strong-Willed Child—Part Two. Attendees regularly use such terms as “uplifting,” “liberating,” and “empowering” to describe this powerful yet immensely entertaining presentation. Today’s parents approach the teen years with great anxiety and trepidation. These are the peer pressure years, the years during which the child begins to declare his or her independence and move toward emancipation. The problems that develop in the parent-teen relationship, says John, are usually due to parents who don’t want to give the teen enough freedom and a teen who wants more freedom than he or she can handle. Is there a middle ground? Yes, there is, and John describes it in terms of a macro-management style that focuses on the “Six C’s of Teen-Proofing”: curfew, cash, car, conflict, consequences, and colleagues (a.k.a. co-conspirators). 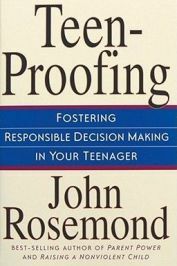 The parenting style that John provides all but insures that teens will take responsible control of their own destinies during the most significant years of their childhoods and approach emancipation with confidence and purpose. Footnote: This presentation, which is based on John’s best-selling book of the same title, can also be delivered as a 3-hour mini-skillshop. In the 1950s, during the height of America’s post-war Baby Boom, children were crammed into what today would be considered “criminally overcrowded” classrooms. It was not unusual to find one teacher teaching 40 or 50 elementary-age children…by herself, with no aide. Yet children at every grade were achieving at considerably higher levels than are today’s kids, kids who rarely attend an elementary class of more than 25 children taught by a teacher and an aide. How was this possible? The answer: By the time the child of the ‘50s came to first grade, he had been taught, in the home, by his parents, the “Three R’s” of Respect for legitimate adult authority, a willingness to accept Responsibility, and a Resourceful attitude toward challenge. As a consequence, the ‘50s child (and children in all generations prior) came to school having learned to pay attention to adults, accept assignment, and do his or her best—a virtually fail-safe formula for school success. John shares the nuts and bolts of this traditional child rearing formula with today’s parents, empowering them to go home and empower their children for life-long achievement. More parents have problems with discipline than with any other single child rearing issue. For many parents, these problems begin during toddlerhood with tantrums, toilet training resistance, and defiance, and only get worse. This 90-minute presentation, which can be extended to a mini-workshop (3 hours), provides parents with the information and skills they need to begin making significant positive changes in their discipline style and therefore, their children’s behavior. The “Keys” to Effective Discipline are Commanding Communication, Compelling Consequences, and Confirming Consistency. John describes these as three legs of the disciplinary tripod and emphasizes that weakness in one of the legs will cause the entire structure to “wobble” if not collapse altogether. He shows parents, through example, how to communicate so as to “nip” misbehavior in the proverbial bud and/or “lower the boom” on misbehavior that has already grown to mammoth proportion. Finally, he provides parents with a concrete definition of consistency that makes practical sense. As usual, John laces this talk with humor, and plenty of it! Parents are sure to leave feeling not only relieved of significant guilt and anxiety, but also inspired, informed, and ready to go home and become calm, self-confident leaders of children. Working with Parents of Problem Students is a 3-6 hour teaching in-service for teachers, counselors, school psychologists, and other education professionals. It is consistently rated as “the best in-service I have ever attended.” The emphasis throughout is on practical, field-tested strategies for assigning full responsibility for classroom behavior and academic performance to the underachieving/problem child. Approaching the “Reluctant” Parent: There are more parents who have a reputation for being defensive and uncooperative than there are parents who are actually defensive and uncooperative. John shares effective ways of selling parents on the idea of forming an “educational alliance” with their child’s teacher(s). Homework Management: John outlines a homework management plan which has been close to 100% effective at helping children accept responsibility for their homework. Motivating the Underachiever: Design and implementation of motivational strategies for underachieving and/or misbehaving students from grades one through high school. Included are strategies for resolving classroom behavior problems. Understanding and Managing the Child with Attention Deficit Disorder (ADD): John brings the expertise he’s gained working with hundreds of ADD children to this module. He discusses the symptom picture, theories as to cause, what to do if you suspect ADD, the controversy surrounding the use of medication, and strategies for effective treatment. Footnote: An abridged version of this in-service can be delivered a 90-minute presentation, in which case the sponsor and/or participants pick the primary area of concentration. Motivating the Underachiever is a 3-5 hour teaching in-service for teachers, counselors, school psychologists, and other education professionals. It is consistently rated as “the best in-service I have ever attended.” The emphasis throughout is on practical, field-tested strategies for assigning full responsibility for classroom behavior and academic performance to the underachieving/problem child. Motivating Strategies for the Underachiever: Design and implementation of motivational strategies for underachieving and/or misbehaving students from grades one through high school. Included are strategies for resolving classroom behavior problems. Footnote: This seminar can be structured as either a 90-minute presentation or a 3-hour or 5-hour workshop. The “parent version” of Working with Parents of Problem Students (see description above), this 3-hour skillshop based on John’s best selling book of the same title, which many schools have actually bought and distributed to the parents of every student! Participants learn the fundamentals of John’s innovative, yet commonsensical homework management system as well as a number of creative strategies for motivating the underachieving child. The emphasis is upon returning responsibility for homework and school performance to the child in ways that promote achievement, autonomy, and self-esteem. The material John shares in this eye-opening skillshop is as appealing and helpful to parents of early elementary age children as to parents of high school students. Working knowledge of a three-step homework management system designed to minimize parent involvement and maximize student responsibility and achievement. Creative strategies for (a) motivating the underachieving child and (b) managing the misbehaving child.Creative strategies for securing parent cooperation regarding motivational and/or behavioral issues. Practical strategies for working with children who have been diagnosed with attention deficit disorder or who appear eligible for the diagnosis. Footnote: This can also be structured as a 75-90 minute presentation. Explaining themselves to their children, doing for them what they are perfectly capable of doing for themselves, praising every little thing they do, using consequences that are, in the final analysis, meaningless...these are but four of the ten biggest mistakes parents make, and make over and over and over again. 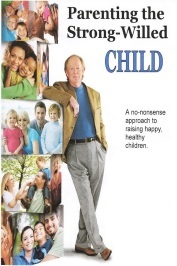 In this provocative yet humorous presentation, John Rosemond's message is, "You ARE a good parent; you don't need to do anything more than you're already doing; you just need to stop doing these ten things and everything will fall neatly into place." Simple, commonsensical, practical...as easily said as done. You're More Than Just a Mom! It is a fact that the raising of a child is an uncomplicated matter. Yes, there will be bumps in the road, most of which will be "everyday" and surmounted fairly easily. Why, then, are so many of today's moms feeling high levels stress, anxiety, and frustration? John's answer to this question - in a phrase, the pressure of membership in what he calls The Good Mommy Club - will be illuminating, liberating, and often humorous.